We know that a binary operator requires two operands in which it performs the operation. Say, for example, the addition operator adds two numbers and hence it requires two numbers and we call that two operands and the + that performs the addition operation as the PLUS operator. Now let us consider the number “-12”. Here the minus states the negation of the number and the negation operate on only one number. So we can say – as a unary operator. In this Hub, we will see how to overload ++ unary operator in both prefix and postfix forms. The class TheNumber shown below has two private integer members. The constructor with two integer parameter initializes the class private members. Print method of this class prints the private member values in the console output. 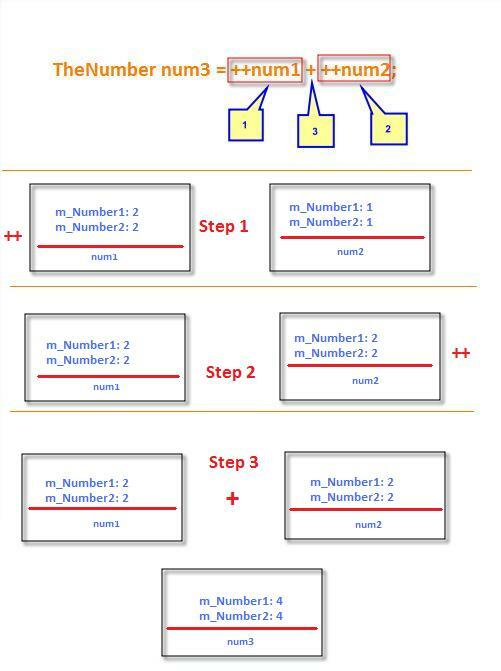 In this implementation, we increment both the private members with a value of one. Once this is done, the current object is returned to the caller. Remember that the current object is the operand also. With this overloaded operator, you can use the prefix notation of increment on the object. For example, if the instance of the TheNumber is K, then we can use ++K, to increment both of the private members of the K.
First, the prefix increment for the number is called. Secondly, the prefix increment operator for the num2 object is called. Thirdly, the binary operator + is called on both the objects num1 and num2. If you need more explanation, have a look at the below picture. In the postfix operator we make the changes on the real objects and but at the same time, we return the cloned copy which was taken before the change was applied to the real object. 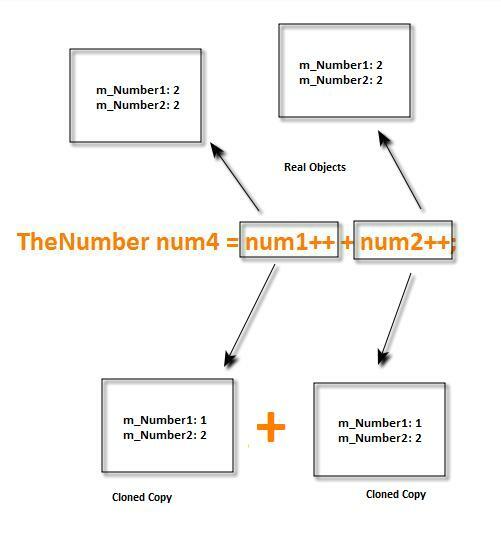 The binary plus operator actually operates on the cloned copies and hence we get the members with a value of two in the result object num4. O.K. I didn't understand a thing outside of binary. My husband is the computer engineer and he speaks Unix and Linux and sometimes English. Thanks for the information MaskedBit. It is useful. There are a couple of fine details to pay attention to when implementing the postfix increment and decrement operators. First, the return type of the function should be const: "const TheNumber operator++(int) ..." Returning a non-const object allows statements like "myNum++++;", which will NOT increment myNum twice. The second detail is that, to ensure that the prefix and postfix forms perform the same increment, good practice calls for implementing the postfix form using the prefix operator. There's a thorough discussion of these details in Item 6 in "More Effective C++" by Scott Meyers. Even though it's a bit old now, it's still an invaluable reference for any C++ guru.